Tahzeeb Nawab has seven sisters and one brother. Not unusual for a Pakistani family, they turned westwards for their future. Nawab's siblings live in the US and Europe, where they got an education and a job after obtaining scholarships. Her brother sponsored himself to study abroad, and two of her sisters scored positions at the US and Malaysian embassies after completing their studies. However, it wasn't Nawab's siblings but her uncle who had influenced her future most. He lived in Tianjin in north China. "China is rising day by day," he had told her. So, Nawab, 27, decided to turn eastwards for her education. The Chinese government supported her decision with a full scholarship, and she came to the Beijing Institute of Graphic Communication to do a master's in enterprise management. Nawab is just one of an ever-growing number of students who are attracted to the Middle Kingdom by China's preferential policies for countries along the Belt and Road initiative routes. In 2016, there were 207,746 overseas students from 64 countries along the routes studying in China, an increase of 13.6 percent compared with 2015, according to statistics from the Ministry of Education. The figures also revealed that students from Belt and Road countries received 61 percent of the Chinese government's scholarships, even though they made up for a little less than half of the international students in 2016. "[The government offers] 10,000 places each year to students from countries along the Belt and Road initiative [routes] to study in China under the support of the Chinese Government Scholarship," an official of the ministry told AFP in a 2017 report. Nawab's decision to come to China to study, therefore, is not an isolated case. A total of 19,000 Pakistani students were studying in Chinese universities in 2016, AFP reported. They are not just coming for the affordable education and job prospects but also for the general experience and quality of life possible in China's big cities. "The scholarship is just a bonus," Nawab told Metropolitan. "China is an extremely diversified country with plenty of options and career opportunities." But she didn't feel that way from the start. "When I first landed in China, I thought to myself, 'Oh my god, what did I do with my life,'" Nawab recalled. Realizing that she moved to a place where she didn't speak the language and wasn't familiar with the customs, Nawab started to put effort into studying Chinese language and culture, and it changed everything. "Now, I am adjusted to living here. It's the best country," said Nawab. She shares her overwhelmingly positive experience with her compatriots. 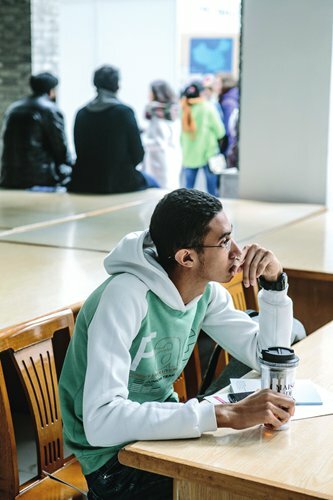 Ali Haider, a computer science student at the Beijing Institute of Graphic Communication, loves living in China because of its people. "They are so helpful and kind," he said. For him, the high number of Pakistani students in China is due to the "strong bond" between China and Pakistan. "Pakistan considers China as one of its closest friend and partner, and China considers Pakistan as its 'Iron Brother,'" the Pakistani Embassy in Beijing writes on their website. The China-Pakistan Economic Corridor, an energy and infrastructure project worth $57 billion, is a signal of those close bilateral ties. Another consequence of this bilateral relationship is that Pakistan has become the fourth strongest source of international students to China, the Ministry of Education reported in 2017. Pakistan is about to upgrade its higher education system too, as the Pakistani economy is becoming more knowledge-based. According to an article by Times Higher Education, the online magazine of digital education TES Global, which provides university rankings, the Pakistan Vision 2025 program seeks to provide higher education to 12 percent of its young people. At present, only between 6 and 7 percent are enrolled in higher education institutions. Domestic efforts combined with the attractiveness of studying in China has changed the mindset of Pakistan's young generation. Traditionally, those who could afford it would send their children to the UK or the US. Now, Pakistani from the upper and lower middleclass apply for scholarships to study in China. "The percentage of Pakistani going to China to study is on the rise, while the percentage of those who seek Western education is lowered," Syed Junaid Akbar, a Pakistani business school student at North China Electric Power University, said. His observation is supported by numbers. The British government reported to AFP in 2013 that overall, 20 percent fewer student visas were issued in 2012 compared to the previous year. It added that 5,045 students from Pakistan studied in the US between 2010 and 2011, but that the number has declined steadily since the 9/11 attacks. "For many Pakistani, China is the 'New West,'" the AFP article stated in its title. Akbar, 26, moved to China in 2016 for a business development internship. When he returned to Pakistan, he found that he could not readjust to the environment there. "The living standards are way better in China," Akbar said. "In China, you don't have to worry about the infrastructure or daily necessities." Akbar came back to China on a scholarship from the Chinese government. His sister is now reading for a master's degree here, and he shares an apartment in Beijing with his brother who works. Through the Belt and Road initiative, bilateral exchange between China and other countries has also expanded to education. According to statistics from the Ministry of Education, Belt and Road countries accounted for seven of the 10 largest source countries of international students to China in 2016. They are Thailand (3rd), Pakistan (4th), India (5th), Russia (6th), Indonesia (7th), Kazakhstan (8th) and Vietnam (10th). Twenty-four-year-old Masum Hossain Rusho from Bangladesh got a full scholarship from the Jilin provincial government to pursue an MBA at Changchun University of Science and Technology. Chinese friends he met in India convinced him to come to China for his master's degree after completing his bachelor's degree in India. But he had to convince his parents first. "In Bangladesh, people with an MBA degree are in high demand," he explained. "I made them understand how an MBA would positively influence my job hunt." But Rusho, who has a Chinese girlfriend, might not go back to Bangladesh upon graduation. "My life is here now," he said, adding that companies from Beijing are already calling him for job interviews. The Ministry of Education wants to attract half a million international students by 2020, it announced in 2013. It is on track too. With the number of international students exceeding 440,000 in 2016, a 35 percent increase over 2012, China has become the third largest destination for international students worldwide and the largest one in Asia. Haider was the only student in his school in Islamabad, Pakistan's capital, to obtain a scholarship from the Chinese government because of his excellent marks. Akbar and Nawab were also awarded academic scholarships for scholastic excellence. Akbar plans to look for a job in China after graduation. Meanwhile, Nawab will play host to two of his best friends who are planning a visit to the country this summer. "They might follow my steps and study in China," she said. "I have the talent to motivate anyone."